Zenone is located in a holiday villa set among 5,000 m2 of age-old olive trees, lush vegetation and manicured lawns. 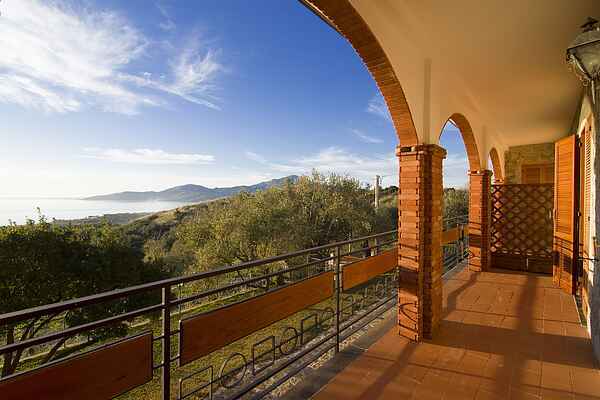 It is situated in Ascea Marina in the heart of the Cilento Park and opposite the Gulf of Velia. The holiday villa has undergone recent renovation work and affords splendid views over the sea and Ascea's fine white sand beach. This oasis of peace and tranquillity boasts a furnished garden and a relaxation area with benches for reading and day-dreaming with Velia tower as a scenic backdrop. This villa is ideal for couples and families wishing to spend a nature-themed break in the Cilento Park area, with its temperate and wholesome climate, and just 5 minutes by car from Ascea Marina's Blue Flag beach. Ascea municipality, located within the Cilento and Vallo di Diano National Park, is one of the Cilento coast's major tourist destinations. For the last few consecutive years, along with other Cilento coastal towns it has received a Blue Flag for its beaches and 3 sails from the Italian environmental association. Ascea Marina's long, wide beach features a rock formation to its southernmost point. Here visitors can admire sea daffodils, typical Mediterranean vegetation and discover the Argento and Rondinella Bays, which can only be reached via boat. The seafront promenade, with its cycle path and pedestrian area is perfect for recreational activities. From the Sporgente belvedere in Ascea Capoluogo, enjoy coastal views stretching from Punta Licosa to Capo Palinuro. Climbing to the highest point of the town in the Catona area, visitors will come across Madonna del Carmelo Sanctuary, one of the Seven Sister Churches facing each other in a valley that leads to the sea from Mount Gelbison. Parmenide's city - Elea Velia Ascea is also home to the remains of the ancient city of Elea-Velia, the birthplace of the philosophers, Parmenide and Zenone and to the Eleatica school, which is now an archaeological park. Declared a UNESCO world heritage site, it is among the most important archaeological sites in Campania. The perfectly conserved Porta Rosa can be considered the most important monument in Velia: it is the first example of a rounded arch built in Italy, with a Greek mould. Remains open to visitors include the southern district, the Arian thermal baths, the acropolis and the medieval castle, with its Palatine basilica. From Ascea it is possible to visit the entire Cilento Park (Italy's largest national park) with its beautiful natural marine landscapes (Palinuro caves and Camerota beaches) and mountain scenery (Mount Gelbison and Mount Cervati), equal in their grandeur. Visitors will find numerous restaurants serving local traditional dishes and fish from the Gulf, as well as Cilento recipes including fusilli and cavatelli pasta, stuffed ravioli, soups and potato dishes.